The countertop George Foreman grill is known for its ability to cook everything from vegetables to chicken breasts. 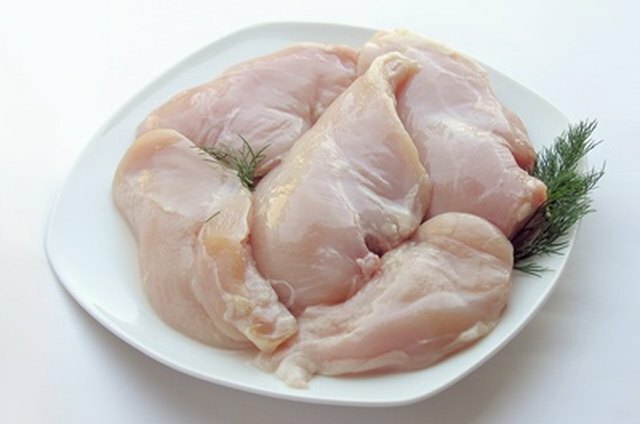 When it comes to chicken breasts, the cooked meat temperature tends to be less forgiving than other types of meat, as poultry is more likely to carry salmonella or other harmful bacteria. 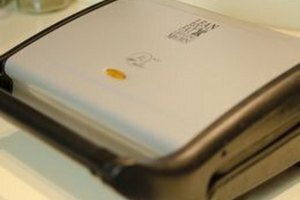 The devices have an upper and lower grill that, together, cook food at an even rate without the need to flip the food over. This makes it easier to get perfectly cooked chicken breasts without the risk of an undercooked side of meat. Thaw the chicken breasts in the refrigerator overnight. 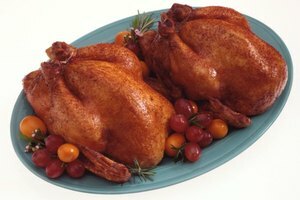 If you are in a hurry, thaw chicken under cool running water or in the microwave on the "Defrost" setting. The chicken will not cook evenly unless it is thawed. Wipe the grill clean with a dry paper towel to remove dust. Plug the grill into an electrical outlet. Close the lid to the grill and let it warm up for five minutes, or until the orange light clicks off. Position the grease-drip tray under the front of the grill. Put on an oven mitt and open the lid to the grill once it warms up. Place the chicken breasts on the grill, but do not let them touch. Close the lid. Leave the chicken on the grill for nine minutes for each inch of thickness. Open the lid after the recommended cooking time. Stick a meat thermometer in the middle of each chicken breast to ensure that the internal temperature is between 170 and 180 degrees Fahrenheit. If necessary, cook the chicken longer until it reaches the correct temperature. Remove the chicken from the grill with a plastic spatula once it's cooked.